The Wikid GRRLs project began with an article in the New York Times in 2011 on Wikipedia’s gender gap, reporting that less than 15 percent of the contributors to the online encyclopedia are women. A huge gap, especially for a project aspiring to collect the “sum of all human knowledge.” I was intrigued to find out more about the reasons for this gap. Together with Linda Steiner, professor in the Philip Merrill College of Journalism at the University of Maryland, I studied the background of this gender gap and the responses to it in online comments. More than three quarters of commentators reasoned that Wikipedia’s gender gap matters as it might also be the last encyclopedia; yet, solutions were not easy to come by. One factor that we found particularly significant was that engagement with STEM subjects (science, technology, engineering, and mathematics), including computer science, becomes increasingly gendered as kids grow older. Around middle school, students solidify the idea that somehow tinkering with computers is not for girls; their confidence in STEM-related skills is lower compared to boys. While these two studies were being published, the first Future of Information Alliance (FIA) Seed Grant Competition was launched at the University of Maryland, with support from the Robert W. Deutsch Foundation. This prompted us to design an intervention to teach middle school-aged girls online skills and to boost their confidence in working on the production side of computing. We assembled an interdisciplinary team of doctoral and undergraduate students and two faculty mentors, developed a curriculum for a ten-week after-school workshop, and secured partnerships with schools in Maryland. The hard work of organizing this all in a short time frame, including IRB-approval, paid off: We received one of the FIA seed grants! We were overjoyed and went to work. 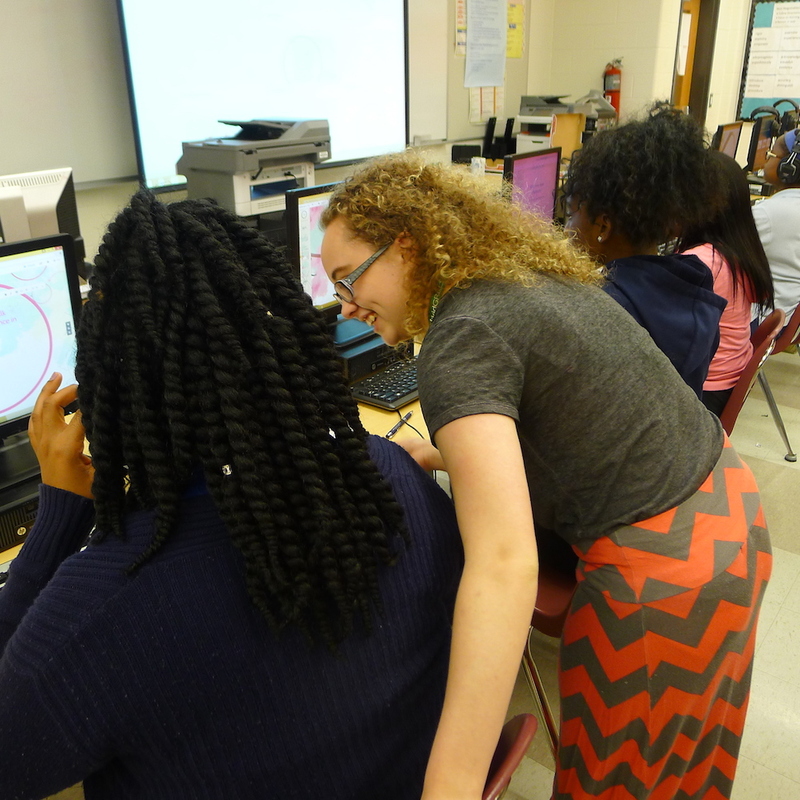 During the spring of 2013 we launched Wikid GRRLS in four schools and taught 40 (mostly minority) girls lessons on coding, writing on a wiki platform, internet safety, netiquette, smart searching strategies, online polling, presenting with Prezi and more. Snacks helped to keep the girls going in the afternoons after a long school day. 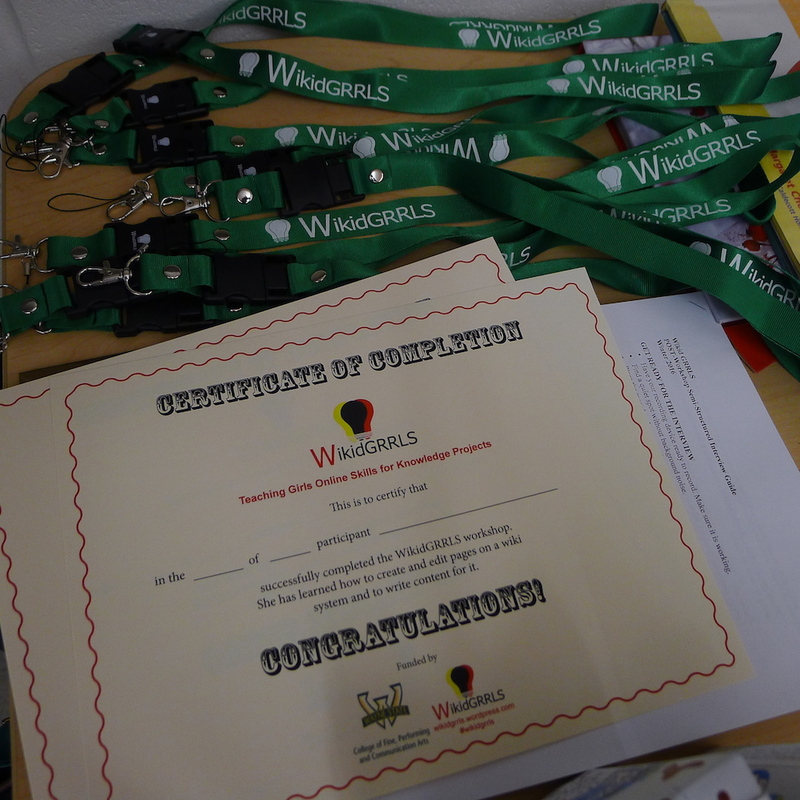 In the last session the girls presented their wiki articles and we rewarded them with a Wikid GRRLs certificate, flash chip and lanyard. The pilot was a success; pre- and post-workshop surveys showed the girls had gained skills and confidence. As I graduated and became an assistant professor in the Department of Communication at Wayne State University, I took the Wikid GRRLs project with me. After settling in and organizing a new structure at a new university, in a new city, Wikid GRRLs re-launched in 2015 at two Detroit Public Schools. Supported by two grants from Wayne State University, I recruited four honors students to teach the Wikid GRRLs curriculum in the fall semester of 2015. In turn, the honors students received credits for a service-learning requirement. It turned out that service learning is a focus at Wayne State University and Wikid GRRLs fit right into that spirit. Several mentors in the Department of Communication, the College of Education and the Honors College smoothed the way to turn Wikid GRRLs into an honors class, including research components for the undergraduate students. Additionally, I became advisor to a new doctoral student, Jade Metzger, who became an invaluable assistant to get Wikid GRRLs off the ground in Detroit, to conduct interviews and surveys, and lead classroom discussions with the honors students on the gendered pay gap in STEM; the dearth of computer science classes in K-12 grades; and efforts and challenges to recruit more women into STEM fields. Again, the team effort made it possible to bring Wikid GRRLs to Detroit, thus far working with three schools and teaching about 25 overwhelmingly minority, middle school-aged girls who were enthusiastic participants. While in Maryland it was relatively easy to convince schools to host Wikid GRRLs as a free after-school program; in Detroit the many financial and structural problems in the Detroit Public School system made it much more difficult to get schools involved with Wikid GRRLs. The three schools that welcomed Wikid GRRLs did so because of supportive principals and incredibly dedicated teachers to function as liaisons between our team and the participating girls, to allocate a lab and create a schedule. Without them the project would not have been possible. Neither would Wikid GRRLs have worked without the seven Wayne State University honors students and Jade who jumped into this adventure with me. The honors students learnt more about the intersections between gender and STEM and conducting research in the field; they gained confidence in teaching and became advocates for the Wikid GRRLs project at the annual FemTechNet conference in April 2016. Yet, the best reward remains the participating girls’ joy in learning more about computers, their eagerness to express themselves in writing, their progress in online skills and increased confidence in working with wikis. We logged their progress in pre- and post-workshop interviews and surveys and are currently working to publish these results. Going forward, Wikid GRRLs needs to find new funds; update and expand its curriculum; and include a longitudinal element to track if participants’ immediate gains in skills and confidence translate into long-term benefits, for instance, choosing a STEM-related career, writing for Wikipedia or working on their own online projects. The seed that the Future of Information Alliance sowed with Wikid GRRLs more than three years ago blossomed into a fruit that has benefited more than 65 (overwhelmingly minority) girls, nine undergraduate students, three graduate students and three faculty members. The Wikid GRRLs project demonstrates that FIA’s seed grant program is a highly valuable vehicle to spread the idea that information equity and literacy is a currency well worth investing in. The first results of the Wikid GRRLS intervention will be presented at the annual conference of the Association for Education in Journalism and Mass Communication (AEJMC), August 4-7, 2016 in Minneapolis. This paper has been awarded 3rd prize in the Faculty Paper Competition of the Commission on the Status of Women (CSW). A short summary and video about the initial Wikid GRRLs project that was part of the 2012-2013 FIA-Deutsch Seed Grant Competition can be found here.